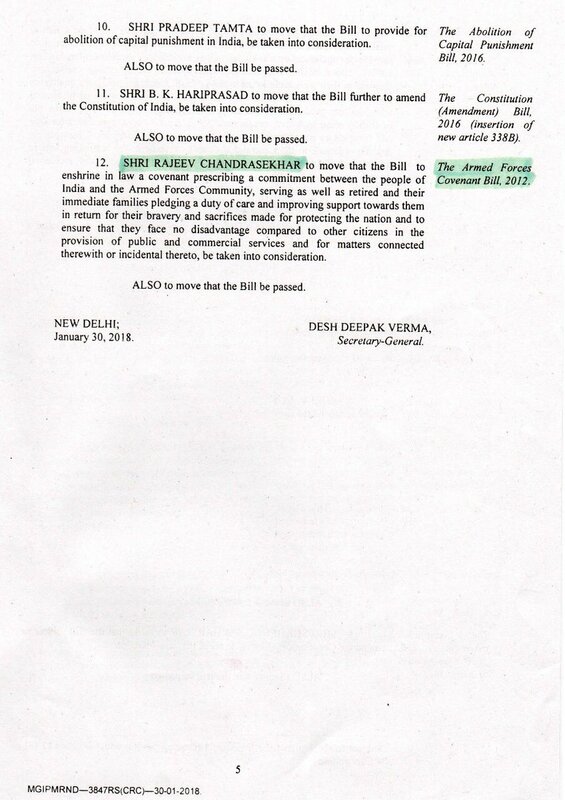 See the mighty GOOD THING happening on 02 FEB 18, when Sri RAJEEV CHANDRASEKHAR MP, moves THE ARMED FORCES COVENANT BILL, 2012 in Parliament, as tweeted by him. Once a reality, it would be a great boon to the Armed Forces Community, serving, retired and their families. OROP is also finds a place in the bill. The Military Community shall ever be indebted to him for this act of Shri Rajeev Chandrasekhar, MP - Sir. WE ARE PROUD OF YOU SIR. MANY MANY THANKS FOR YOUR YEOMAN SERVICE TO THE MILITARY COMMUNITY. Let us all together pray for its passing in Parliament. CLICK AND READ THE BILL LEISURELY. I will time permtg move my long pending Pvt Members Bill -The Armed Forces Covenant Bill 2012, in Parl on 2nd Feb. This Bill is the need of the hour to affirm the Nation's commitment to our #ArmedForces personnel & their families. You are always in the forefront to fight for the causes of the defence personnel. Sir, we the esm community with family will remain grateful and loving to the great service u render to us; Through the great karma, u are well in the path of "Dharma"... let u be blessed !